Elizabeth Trammell is also writing her honors thesis on a similar subject. A Setback for Russia’s Lake Baikal – BusinessWeek. So, apparently, President Yar’Adua was secretively brought back into Nigeria. And now some people are questioning the authority of acting President Jonathan. Abuja — THERE were more questions than answers about happenings at the nation’s seat of power, the Aso Rock, yesterday.The signs of cleavages and outright disloyalty to the Acting President were glaring. This may have even landed the Commander, Guards Brigade of the Nigerian Army, Brigadier General Abdul Mustapha a verbal query. via allAfrica.com: Nigeria: Power Play Rocks Aso. A coup has taken place in Niger and the president has been captured after a gun battle in the capital, Niamey. 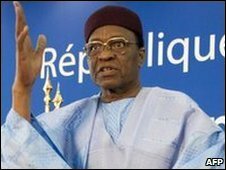 In a television announcement, a spokesman for the plotters said Niger’s constitution had been suspended and all state institutions dissolved. The country was now being led by a group called the Supreme Council for the Restoration of Democracy (CSRD), the spokesman said. President Mamadou Tandja is believed to be in captivity at a military barracks. Frightening. And this is a real fish. The blobfish. So, as I posted last week, two stories to watch are the electoral cycles in Cote d’Ivoire and Nigeria. And two very interesting developments have taken place over the last week. First, “Goodluck Jonathan” has become the official acting president of Nigeria. This is significant for two reasons. One is that it means that Yar’Adua has truly lost his grip on power after (now) more than 80 days of sick leave. A second is that Jonathan is from the South and there is a sort of gentleman’s agreement in the main party there that leadership will rotate between the South and North. And many in the North expected to get two terms out of Yar’Adua. So, will Jonathan step aside in the upcoming election, or will he use his position as acting President to gain more authority. Thus far, he has been cautious. Meanwhile, much more serious things have been happening in Cote d’Ivoire where Laurent Gbagbo dissolved the government. This apparently stops all plans at having an upcoming presidential election. And members of the opposition are reportedly saying that they no longer recognize Gbagbo as president. Gbagbo has never demonstrated an ability to work across political lines. In many respects, he has played an important role in his country’s decline from being a potential economic “lion” to being just a great disappointment. In Nigeria, elections in the southeastern Anambra state, were marred by allegations of fraud and claims of disenfranchisement. The concern is what this might signal for next year’s Presidential election. Fortunately, the election itself was largely peaceful… this time. Meanwhile, in Cote d’Ivoire, many are claiming they are being disenfranchised from upcoming presidential elections. These are two of the most important countries in West Africa. The region as a whole could prosper were greater political stability to come to these two countries. What happens in the 16 months in those two countries may set the political trajectory for the region for the next five to ten years. The BBC and others are reporting that the Confederation of African Football has banned Togo from participating in the next Africa Cup tournaments. Why? Because after being shot at and seeing their comrades killed in Angola they decided to withdraw from recent competition. At least, that is the general story (see clip below). Some observers, such as Nkareng Matshe, have tried to point out that the ruling was based on the fact that the Togolese government requested its players withdraw. And the Caf does not like governments “meddling”, in their affairs. The argument is that some Togolese players wanted to keep playing, in memory of their fallen teammates, but were “summoned” home early by their government. While government meddling may be a legitimate concern, this does not seem like a great place to make a point. Even if the players said they wanted to go on playing, I suspect a legitimate argument could be made that they were in shock and that it may have been equally as good for them to go home (note: I’m not a psychiatrist or psychologist so this is not a professional opinion). And it may be that their best interests were what their government had in mind. And, if anything, Caf owes Togolese players an apology for poor security in Angola. This is one bad decision by Caf that I expect will be overturned, especially as news of it continues to spread and protests continue in Togo. 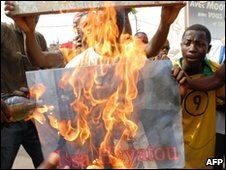 More than 10,000 people have demonstrated in Togo against a decision to ban the country from the next two African Cup of Nations tournaments. The Confederation of African Football (Caf) suspended Togo for withdrawing from this year’s competition in Angola. Togo pulled out after an attack on its team bus killed two officials on 8 January, days before the tournament. This is a great graphic for representing the relative size of different areas of expenditure and the proposed changes for next year. Not necessarily a whole lot of surprises in here, however. One of the biggest increases is for the net interest that we pay on debt (from $US 188 -> 251 billion). Spending on “international affairs” is modestly decreased, but most of that is due to a decrease in the “foreign military sales trust fund”, which is part of our military assistance to other countries. Spending on the Peace Corps is up! Obama’s 2011 Budget Proposal: How It’s Spent – Interactive Graphic – NYTimes.com.